I've bought all 3 of these t shirts now. Very nice fit, very comfortable, breathable material. Nice colours, although it would be nice to see some other colours available, maybe a red or the dark blue they have on the long sleeve version. I did not expect to receive a t-shirt of such quality. The fabric and detailing in brilliant. The pictures don't do it justice! Definitely getting more. Cheers MyProtein. Great tight peice. Almost like a thermal in terms of fit. Excellent for showing off your gains! Had so many compliments from it. This design and material is My Protein best t-shirt yet! Figure hugging and good variety of colours. Teal is something a little bit different but goes well with simple black joggers or shorts. best design and material I ever buy, very nice color and hope that you will sell it in many new colors. 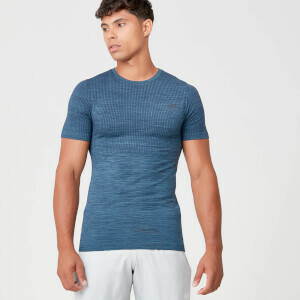 This top is a great product! Fits true to size, wicks sweat and leaves you feeling dry and comfortable. There are seams where the sleeves meet the shoulders but they are not intrusive and do not rub the lats or under arm. Nice to chill out in at home or casual to wear out with joggers. They make you look more muscular and have a good length on the body and the sleeves are nice and soft on the bicep and don't dig in. It's a great product for a great price.